1. Acquire estimates from reputable local contractors. 2. Check equipment-only prices at your local home center. 3. Deduct the price of the equipment from your estimates. This is the amount being quoted for the installation portion of the estimate. Subtract your expense for the installation option of your choice, and that is how much you will save. Feel free to contact us with any questions or concerns you may have and we will be happy to assist you. Save money on your heating and cooling expenses by following these simple Maintenance Tips. Estimate the approximate cooling efficiency of your current air conditioner. The SEER, or “Seasonal Energy Efficiency Ration,” is how condenser efficiency is rated. If it’s more than 10 years old, the efficiency is likely to be 6.0 SEER. Then, using your total electric bill, estimate your current annual cooling cost. Don’t forget to eliminate the cost of other electric use. 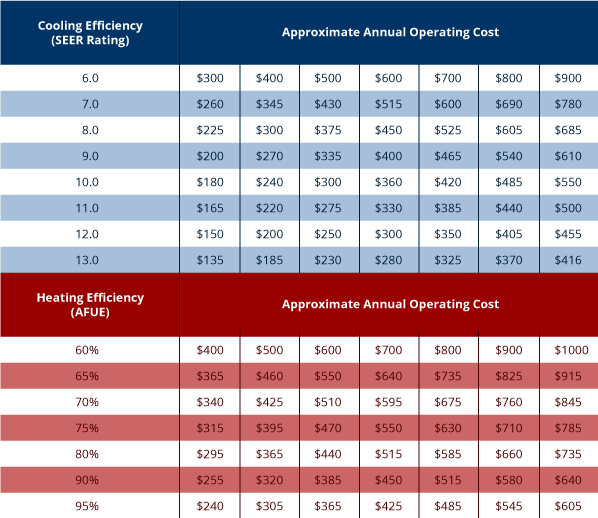 Use the chart to estimate how much you can save with a higher efficiency system. Example: If your current air conditioner has a SEER of 6.0 and your annual operating cost is $600, the cost to operate a new 12 SEER system will be approximately $365. This gives you an estimated annual savings of approximately $235.00. Estimate the approximate heating efficiency of your current furnace. If it’s more than 10 years old, it’s likely to be 60% efficient. Then, using your total fuel bill, estimate your current annual heating cost. Don’t forget to eliminate the cost of other fuel use. Use the chart to estimate how much you can save with a higher efficiency system. Example: If your current furnace is 60% efficient and your annual operating cost is $700, the cost to operate a new 93% AFUE system will between $425 and $450. This gives you an estimated annual savings of approximately $250.00 to $275.